The hotel is situated beside the exit of the train station. Walk on your right-hand side and cross the main square (Piazza Garibaldi) in front of the station. You will notice a large statue located right in the middle. Behind the statue is Via P.S. Mancini; you will find the hotel on your left-hand side. Nearby are many classical restaurants or pizzerias such as: Da Mimì, Antica Pizzeria Da Michele and Trianon. Also within walking distance is the historical centre (the ‘Decumano Inferiore') of Naples with its monuments and churches (the Duomo, Cappella S.Severo, the cathedral of S. Chiara, Gesù Nuovo, S. Lorendo, S. Domenico) and the underground ‘hidden city'. Close to the historic centre is the famous Castello Angioino, Castello dell'Ovo, Castello S.Elmo and other important museums such as the Archeological Museum, Capodimonte Museum and S.Martino Museum. This recently-restored hotel is housed in a 2-storey building in the heart of Naples, within easy access of this charming city's numerous historical and cultural attractions. 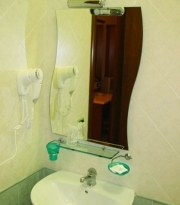 Hotel Garibaldi's modern accommodation combines functionality and quality. Its single, double, triple and quadruple rooms are strategically positioned right in front of the central train station close and conveniently close to the beating heart of Naples. 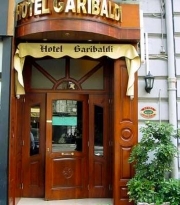 The Garibaldi Hotel offers to its guests 13 spacious, bright and lovingly furnished rooms. Each room has TV, telephone, minibar, air conditioning and all sorts of comforts to make your stay as pleasant as possible. Whether for business travellers or tourists ,a healthy and rich breakfast is very important. That is the reason why at the Hotel Garibaldi you will find every morning a selection of fresh fruit, toast and croissants, fruit juices, coffee, tea, cappuccino, milk, and much more. By Car: The hotel can be easily reached from the Rome-Naples and Salerno-Reggio Calabria motorways. Take the Corso Malta exit and follow the signs to Piazza Garibaldi and the train station. 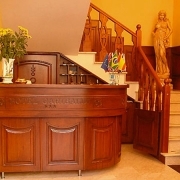 By Plane: Garibaldi hotel is only 10 minutes from Capodichino airport. It is possible to take the Alibus shuttle or the bus line 3S to Piazza Garibaldi.